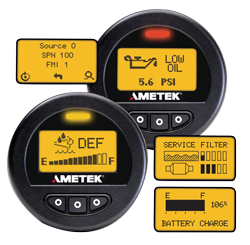 This 2-inch gauge with a graphics display can be configured to read out as any type of gauge. It is ideal for stand-alone applications or to expand an instrumentation system. Because it interfaces directly to the J1939 CAN data bus, and, because of its heavy-duty construction-grade design, it can be installed anywhere on a vehicle. Although it is a standard product, this gauge is highly configurable to a specific application. Backlight colors, application specific graphics, and decals can all be changed. As with all VIS standard products, the VIS engineering team can customize a product faster than other suppliers. That is because VIS has invested in versatile design software and best-practice project management.